Designer Johann Friedrich Netto (German, active 1795–1809) included professionally stitched samples in his pattern book Zeichen-Mahler und Stickerbuch zur Selbstbelehrung für Damen, Zweiter Theil, published in 1798. This book, along with his first volume of embroidery patterns, published in 1795, and a later book of designs for knitting, all follow a format of presenting the designs in both color and black and white. It was an unusual feature for a needlework pattern book to include actual embroidery. 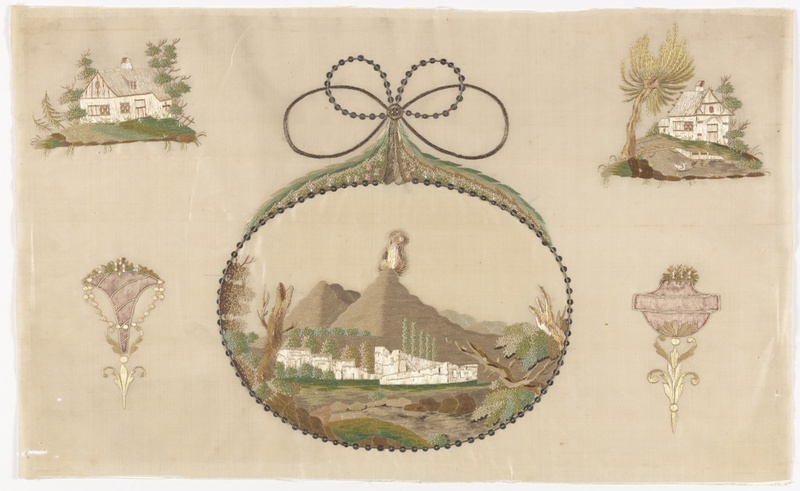 This silk and metal-thread embroidery sample matches the first stitched sample found in copies of Netto’s 1798 book, which is held by both the Metropolitan Museum of Art and Winterthur Museum. While it is possible that one of Netto’s readers stitched this piece using his pattern, the fact that it is nearly identical in execution and materials to the ones within the extant pattern books suggests that this one became separated from its binding. Netto’s use of mixed media and hand coloring would have made these high-end books desirable to collectors. Even so, in this case, use would have taken a toll (ie: removing the black and white pages to use for transferring the pattern to the ground fabric), resulting in loose leaves like this sampler, and explaining the rarity of the embroidery books today. The colors of the silk threads have faded, and the silver threads and paillettes (flat sequins) have tarnished, diminishing the shading effects and details. The smoke at the peak of the volcano is painted on the ground fabric. This representation of Mount Vesuvius erupting is similar to landscape paintings of the end of the eighteenth century, such as Anne-Louis Girodet de Roussy-Trioson’s A View of Vesuvius from Naples, 1793-94. Talia Schaffer, Novel Craft: Victorian Domestic Handicraft and Nineteenth-Century Fiction (Oxford: Oxford University Press, 2011), 39. Mary Linwood (1755-1845), landscape after painting by Salvator Rosa (1615-1753), Victoria and Albert Museum, 1790-1819, Museum no. T.635-1995. No image available. Lisa VandenBerghe is an independent researcher interested in women’s domestic craft with a focus on needlework pattern books produced between the seventeenth and eighteenth centuries. It’s probably best not to provide a link that readers are not able to access.